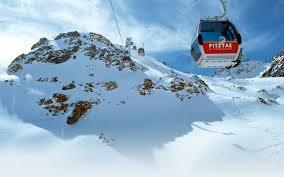 I arrived in Pitztal yesterday after a drama-free journey from home via Frankfurt. Straight down to business this morning; breakfast at 6am and up to the glacier by a train through the mountain where the conditions are excellent. I am sharing my apartment with a racer from the USA and Yurino, my friend from Japan, is also in the same building with her mother. We are all training with Benni Raich Race Centre.